San Diego Unified has 100 special education aide vacancies. The district also has roughly 11 full-time teacher vacancies, nearly all for classes for students with the most severe disabilities. Parents of students with special needs say that without aides, their children have wandered out of class or eaten rocks. For 16 days so far this school year, Josclyn Davis chose not to send her second-grader to school at Sherman Elementary for fear of what could happen to her. Davis’ daughter Aiyana, who is on the autism spectrum and has such a limited vocabulary that she’s considered non-verbal, has already escaped the classroom twice this year. She also has a disorder called pica, in which people have an appetite for non-food items like paper, stones, drywall or metal. Aiyana needs a one-on-one aide to help her with schoolwork, calm her down at times, watch what she eats and keep her from wandering off. But this year, with the transitions, restructuring and staffing shortages throughout special education classrooms at San Diego Unified, Aiyana lost the aide she had for the past two years, Davis said. Minkyeong Jo, the parent of another autistic student with pica, a 5-year-old who attends Hawthorne Elementary, pleaded with district staff at a Nov. 9 special education parent committee meeting to provide her son with a supplemental aide because she’s been finding plastic chips, rocks and even a paper clip in his stool. 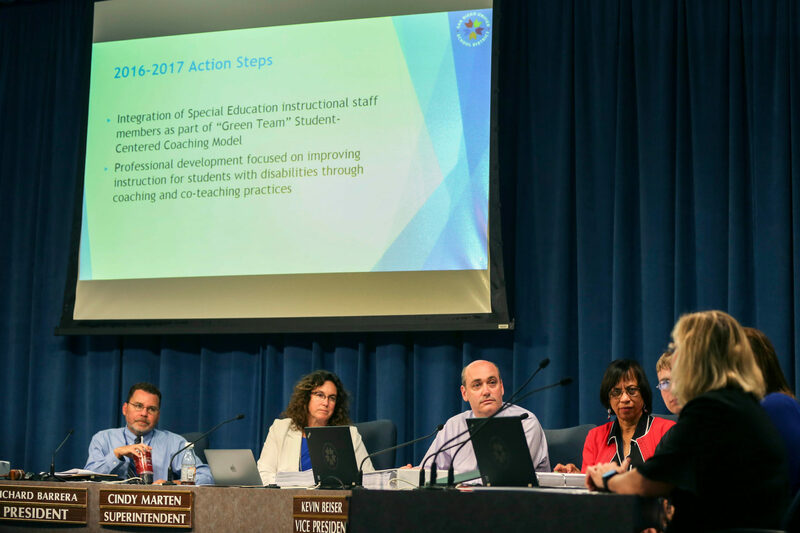 Stories like Davis’ and Jo’s continue to emerge, driving home the severity of the special education staffing shortage at San Diego Unified and illuminating the ways they impact families of some of the district’s most vulnerable students. For her first two years at Sherman, Aiyana had the same special education aide. Davis said her daughter was progressing. Last year, the family was temporarily homeless, living in a different hotel room every night, but the routine and structure at school helped her. She went to school every day, won an award for improving and was even in a play. On the first day of school this year, there was no aide at all. Now, Davis said, you never know which aide Aiyana have any given day, who will show up and who won’t. Often, Davis said, she has to spend 45 minutes to an hour calming her daughter down at school. At the Nov. 9 meeting, one special education aide from Hardy Elementary implored the district’s central office to send more staff to her school. The aide laid out the hours the students with disabilities needed and the number of hours aides were staffed for – there was a roughly 30-hour shortfall between what students needed and how many hours aides were available. To get additional help, the aide said, school staff would have to submit a lengthy document detailing what every student with disabilities needed daily, what staff was currently doing and the gap that needs to be filled. The aide said she and her coworkers had spent hours outside of school working on the document and still aren’t done. San Diego Unified has 100 special education aide vacancies. The district also has roughly 11 full-time teacher vacancies, nearly all for classes for students with the most severe disabilities. Another 37 positions for special education-credentialed teachers are currently filled by interns, though for some of the interns it isn’t their first year teaching at the district. Special education often faces staffing challenges, Deann Ragsdale, executive director of special education at San Diego Unified, told Voice of San Diego a few weeks ago. Ragsdale said the shortages were not a result of budget cuts made by the district. Indeed, other districts seem to be facing the same shortages. The second largest district in the county, Poway Unified, also has a shortage of aides – with 114 vacancies. Poway doesn’t have any special education teacher vacancies, though. Ragsdale said the shortage and high turnover requires workarounds like hiring interns to work as special education teachers, or enlisting parents of kids with disabilities to work as aides. At last Tuesday’s San Diego Unified school board meeting, the chair of the district’s special education committee, Moira Allbritton, expressed concern over the high number of special education aide vacancies and said cuts the district made to address a massive budget shortfall have contributed to the staffing shortage. “I think I say it best with last year’s budget solutions are this year’s problems,” Allbritton said. Davis, the parent at Sherman, is still trying to figure out what’s best for her daughter under the circumstances.